let's be clear...I do not get excited about going back to school at all...I have many, many years of education I feel as if I don't use. However, can I please tell you how giddy I am at this moment! I just signed up for susannah's e-course and I can barely contain myself. I missed my chance last go around...but quickly snatched up spot this time...luckily, because it is over half full! 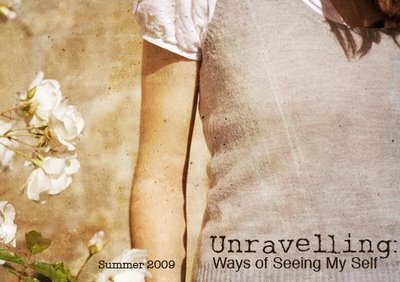 "The Unravelling: Ways of Seeing My Self e-course gives you gentle permission to take a couple of hours out of your week just for you. All you need is a camera and a willingness to play and explore. Beginning with your feet, you are going to go on a photo safari into your own life to reconnect with who you are, where you've been and where you want to go next. These definitely won't be self-portraits in the traditional sense-the are personal images that honor you and your world." I find that through my own photography I can snap away at pretty flowers and landscapes, but fall short when it comes to looking at myself. Self-portraits are really, really hard for me...the fact that Susannah has started a class to redefine the traditional self-portrait makes it all seem really, really doable...actually I look forward to getting to know myself this way. Plus the fact that I am taking a course from one of my favorite photographers...too perfect. oh and if you sign up we would get to be classmates! How cool would that be?